Prof. Saha’s Decoupled Natural Orthogonal Complement (DeNOC)-based dynamic modeling of mechanical systems has citations: 184, h-index: 7 (Total publications citations: 270, h-index: 8) in ISI Web of Science. Saha, S.K. (Author), 2014, Introduction to Robotics, 2e, Tata McGraw-Hill, New Delhi [ISBN 9789332902817 (599 pages)]. Buy the book online from flipkart.com (Indian Rupee) amazon.com (US $). Saha, S.K. (Author), 2008, BME-029: Robotics, (3 blocks), Course Material for Indira Gandhi National Open University, New Delhi [Block 1: ISBN-978-81-266-3365-4 (63 pages); Block 2: ISBN-978-81-266-3366-1 (65 pages); Block 3: ISBN978-81-266-3367-8 (46 pages)]. Sundarraman, P., Saha, S. K., Vasa, N. J., Baskaran, R., Sunilkumar, V., and Raghavendra K., “Modeling and analysis of fuel-injection pump used in diesel engines,” International Journal of Automotive Technology (Korean Society of Automotive Engineers) [IF: 0.606, Springer, June’13], V. 13, N. 2, pp. 193-203. Hanzaki, A.R., Rao, P.V.M., and Saha, S.K., “Kinematic and sensitivity analysis optimization of planar rack-and-pinion steering linkage,” Int. J. of Mechanism and Machine Th., V. 44, N. 1, pp. 42-56. Koteswara Rao, A.B Saha, S.K., and Rao, P.V.M., "Stiffness Analysis of Hexaslide Machine Tools," Advanced Robotics (Int. J. of Robotics Society of Japan), V. 19, N. 6, pp. 671--693. Kamble, N., and Saha, S.K., "Evaluation of torque characteristics of rack and pinion steering gear using ADAMS model," 2005-01-1064, Transactions of SAE, Journal of Passenger Cars—Mechanical Systems, pp. 1217--1222. Ahuja, M., Sadhu, A., Shenoy, M.R., and Saha, S.K., "Fiber optic proximity sensor for mechatronic applications," Asian Journal of Physics, V. 12, N. 2&3, pp. 257--262. Saha, S.K., "Inverse dynamics algorithm for space robots," Trans. of the ASME, J. of Dynamic Systems, Measurement and Control, V. 118, Sept., pp. 625--629. Saha, S.K., "A concept of Primary Body for kinematics of free-flying space robots," Systems, Control and Information Trans., Japan, V. 8, N. 10, pp. 529--534. Saha, S.K., Angeles, J., Darcovich, J., "The design of kinematically isotropic rolling robots with omnidirectional wheels," Int. J. of Mechanism and Machine Th., V. 30, N. 8, pp. 1127--1137. Saha, S.K., "Plant robotics in India," J. of Plant Engineering, Silver Jubilee Issue, Oct., pp. 59--62. Saha, S.K., Chakrabarti, A.K., and Chattopadhyay, A.B., "A comparative study on the performance of cast ZA alloy bearings," Trans. Indian Institute of Metals., V. 48, N. 2, pp. 121-123. Angeles, J., Saha, S.K., and Lopez-Cajun, C.S., "The design of cam mechanisms with translating flat-face followers under curvature constraints," ASME J. of Mechanical Design, V. 116, Mar., pp. 306--310. Angeles, J., Saha, S.K., Gonzalez-Palacios, M., and Lopez-Cajun, C.S., "The design optimization of cam mechanisms with oscillating flat-face followers under curvature constraints," ASME J. of Mechanical Design, V. 116, Mar., pp.311--314. Saha, S.K., and Angeles, J., "The mathematics of motion simulation: a case study," Int. J. of Mathematical & Computer Modelling, V. 15, N. 10, pp. 61--77. Saha, D.K., Mohanty, O.N., Saha, S.K., and Chattopadhyay, A.B., "Cryo-jet cooled grinding," J. of the Association of Engineers, India, V. 62, pp. 36--42. Gupta, R., Sharma, M., Saha, S. K., Prasad, R., Gaur, R.R., and Singh, J., "Technical Interventions for the Empowerment of Rural Women: A Case Study of the Manufacturing of Beads from Holy Basil (Tulasi)" In Mani, M., and Kandachar, P., Design for Sustainable Well-being and Empowerment, IISc Press and TU Delft, pp. 105-112. Kharolia1, V.K., Dutt, J. K., Saha, S. K. and Shah, S. V. Shah, "Studying continuum dynamic behaviour through rigid multibody dynamics," Proc. of IFToMM Int. Conf. on Rotor Dynamics, Sept. 22-25, 2014, Milan, Italy, (Ed. Pennacchi, Paolo), Springer pp. 1823-1830. Gupta, V., Saha, S. K., and Chaudhary, H., “Link Shape Optimization for Input Torque Reduction,” in proc. iNaCoMM2015, IIT Kanpur, Kanpur, India, Dec. 16-19, pp. 1-8. Gupta, V., Koul, M., and Saha, S. K., “Issues in Modelling a Stewart Platform in a Multibody Dynamics Software,” in proc. ECCOMAS Thematic Conference on Multibody Dynamics, Barcelona, Spain, June 29-July 2, pp. 1-7. Sharma P. , Joshi R. P. , Boby R. A. , Saha S. K. and T. Matsumaru, "Projectable interactive surface using microsoft kinect V2: Recovering information from coarse data to detect touch," 2015 IEEE/SICE International Symposium on System Integration (SII), Nagoya, 2015, pp. 795-800. doi: 10.1109/SII.2015.7405081. Saha, S. K., Sinha, S. S., Venkatesan, V., and Gupta, V., “Design, Development and Integration of 6-DOF Motion Platform using Electric Actuator,” SEMSIM2015-A Seminar on Emerging Concepts and Innovative Technologies in Military Simulation and Robotics, Hyderabad, Dec. 2-3. Singh, D.P., Gupta, R.K., Sharma, M., Gupta, Chatterjee, S., and Saha, S.K., "Technology upgradation and diffusion through Rural Technology Action Group (RuTAG) of IIT Delhi," 3rd Nat. Rural Management Symp. on “Rural Entrepreneurship and Enterprise for Inclusive Growth,” KIIT School of Rural Management, KIIT University, Bhubaneswar, Nov. 20-21, pp. Kakoty, N.M., Hazarika, S.M., Koul, M.H., and Saha, S.K., "Model predictive control for finger joint trajectory of TU biomimetic hand, "Proc. of 2014 IEEE Int. Conf. on Mechatronics and Automation, Tianjin, China, Aug.3 - 6, pp. 12252-1230. Udai, A.D., Hayat, A.A., Saha, S.K. "Parallel active/passive force control of industrial robots with joint compliance," Proc. of 2014 IEEE/RSJ Int. Conf. on Intelligent Robots and Systems (IROS 2014) September 14-18, 2014, Chicago, IL, USA, pp. 4511-4516. Tiwan, Punit, Boby, R. A., Dutta R., Sumantra, Chaudhury S., and Saha, S.K., "Cylindrical pellet pose estimation in clutter using a single robot mounted camera", CD-Proc. of the Advances in Robotics--1st Int. Conf. Of Robotics Society of India, R&DE, Pune, India, July 4-6, pp. 1-6. Koul, Majid H., Manivannan, M., and Saha, Subir K., "Enhancing the Z-width of haptic interfaces through dual-rate sampling," CD-Proc. of the Advances in Robotics--1st Int. Conf. Of Robotics Society of India, R&DE, Pune, India, July 4-6, pp. 1-6. Gupta, V., Chaudhary, H., Saha, S. K., "Dynamics of a Spatial Multibody System Using Equimomental System of Point-Masses," in proc. iNaCoMM2013, IIT Roorkee, Roorkee, India, Dec. 18-20, pp. 397-403. Gupta, V., Chaudhary, H., Saha, S. K., "Dynamics of Serial-Chain Multibody Systems Using Equimomental Systems of Point-Masses," in proc. ECCOMAS Thematic Conference on Multibody Dynamics, Zagreb, Croatia, July 1-4, pp. 741-749. Uday, A.D. and Saha, S.K., "Simulation of force control algorithms for serial robots," IEEE/SICE Int. Symp. on System Integration (SII), Kyushu Univ., Japan, Dec. 16018, pp. 481-486. Saha, S.K., Bahuguna, J., Patni, M., Trigune, Gupta R., "Computer methods in the design of metallic carpet looms," Proc. of the Nat. Conf. on Emerging Trends in Mechanical Engineering, June 1, ITM Univ., Gurgaon, pp. 535-540. Gupta, V., and Saha, S.K., "Symbolic computation and simulation of a spatial pendulum," Machines and Mechanisms (Proc. of the 15th Nat. Conf. on Machines and Mechanisms), Eds. S. Bandopadhyay, S.K. Gurunathan, et al., Narosa Publishing House, New Delhi, 2012, pp. 265-272. Koul, M., Rabinowitz, D., Saha, S.K., and Manivannan, M., "Synthesis and design of a 2-DOF haptic device for simulating epidural Injection," 13th World Congress in Mechanism and Machine Science, Guanajuato, México, June 19-24, pp. 1-7. Raghav Bhagat, Siddharth B. Choudhury and Saha, S.K., "Design and development of a 6-DOF parallel manipulator," Int. Conf. on Multi Body Dynamics, Vijayawada, India, Feb. 24-26, pp. 15-24. Sundarraman, P., Baskaran, R., Sunilkumar, V., and Raghavendra, K., Saha, S.K., and Vasa, N.J., Multibody dynamics modelling and experimental validation of fuel-injection pump, Research into Design — Supporting Sustainable Product Development (Ed. Amaresh Chakrabarti), Research Publishing (Prof. of the 3rd Int. Intl. Conf. on Research into Design, ICoRD’11, IISc, Bangalore, Jan. 10-12), pp. 397-404. Jain, A., Yadav, D., Singh, S., Gupta, R.K., Sharma, M., Saha, S.K., "Fatigue testing machine for an artificial knee joint," Proc. of 10th Nat. Conf. on Industrial Problems on Machines and Mechanisms (IPRoMM), MNIT, Jaipur, Dec. 17-18, pp. 31-34. Gupta, R.K., Singh, S., Jain, A., Sharma, M., Saha, S.K., "Computer aided analysis of animal driven gear box," Proc. of 10th Nat. Conf. on Industrial Problems on Machines and Mechanisms (IPRoMM), MNIT, Jaipur, Dec. 17-18, pp. 35-38. Shah, S., Saha, S.K., Dutt, J.K., "A unified approach to dynamics of a biped", Asian Conf. on Multibody Dynamics, Kyoto, Japan, Aug. 23-27, pp. Koul, M, Kumar, Praneeth, Singh, P., Manivannan, M., Saha, S.K., "Gravity Compensation for Phantom Omni Haptic Interface," Int. Conf. on Multibody System Dynamics, May 25-27, Lappeenranta, Finland, pp. Shah, S., Saha, S.K., Dutt, J.K., "Inverse dynamics of legged robots with multiple degrees-of-freedom joints using the DeNOC Matrices", Int. Conf. on Multibody System Dynamics, Lappeenranta, Finland, pp. Sadana, M., Saha, S.K., Rao, P.V.M., "Dynamic analysis of vehicle simulator using CAD applications," CD-Proc. of the Nat. Conf. on Machines and Mechanisms (NaCoMM), NIT Durgapur, Dec. 17-18, pp. 329--336. Singh, P.K, Saha, S.K., Manivannan, M., "Synthesis of two-degree-freedom haptic device," CD-Proc. of the Nat. Conf. on Machines and Mechanisms (NaCoMM), NIT Durgapur, Dec. 17-18, pp. 92--97. Shah, S.V., Saha, S.K., and Dutt, J.K., "Denavit-Hartenberg parameters of Euler-Angle-Joints for order (n) recursive forward dynamics," CD-Proc.of the 7th Int. Conf. on Multibody Systems, Nonlinear Dynamics and Control, Aug.3–Sept. 2, San Diego, California, USA, pp. 1—6. Singla, Aseem, Upreti, K., Rao, P.V.M., Saha, S.K., "A novel technique for measurement of Ackermann error in an automobile," Proc. of the Nat. Conf. on IPROMM, IIT Madras, July 10-11, pp. 197—203. Sundarraman, P., Saha, S.K., Vasa, N.J., Baskaran, R., Sunilkumar, V., Raghavendra, K., "Simulation of a fuel-injection pump used in diesel engines," Proc. of the Nat. Conf. on IPROMM, IIT Madras, July 10-11, pp. 329—334. Sundarraman Pichai, Saha, S.K., "Multibody dynamics approach for the analysis of planar mechanisms with higher pairs," CD-Proc. of the Int. Conf. on Multibody Dynamics (ECCOMAS Thematic Conf. ), Warsaw, Poland, 29 June 29–July 2, pp. 1—11. Shah, S., Saha, S.K., Dutt, J.K., "Modular recursive dynamics algorithm for multibody systems using the DeNOC matrices," CD-Proc. of the Int. Conf. on Multibody Dynamics (ECCOMAS Thematic Conf. ), Warsaw, Poland, 29 June 29–July 2, pp. 1—20. Shah, S., Saha, S.K., Dutt, J.K., "Spherical joint representation in multibody systems," CD-Proc. of the Int. Conf. on Multibody Dynamics (ECCOMAS Thematic Conf. ), Warsaw, Poland, 29 June 29–July 2, pp. 1—16. Ojha, S., Singh, S.P., and Saha, S.K., "Dynamics of flexible manipulators," Proc. Of the 4th European Conf. on Structural Control, St. Petersburg, Sept. 8-12, pp. 581--588. Mohan, A., Singh, S.P., and Saha, S.K., "Estimation of damping in rigid-flexible robotic systems," Proc. of the Int. Conf., on Theoretical, Applied, Computational and Experimental Mechanics., IIT Kharagpur, Dec. 27-29, 2007. Mohan, A., Singh, S.P., and Saha, S.K., "Experimental determination of damping characteristics for a flexible robotic arm," Proc. & CD-Proc. of the Nat. Conf. on Mach. and Mech., IISc, Bangalroe, Dec. 12-13, pp. 305—312. Hanzaki, A.R., Saha, S.K., Rao, P.V.M., "Dynamics modeling of multibody systems with spherical joints using Euler parameters," CD-Proc. of the ECCOMAS Thematic Conf. (Multibody Dynamics 2007), Milano, Italy, June 25-38, pp. 1--13. Hanzaki, A.R., Saha, S.K., Rao, P.V.M., "Modelling of a rack and pinion steering linkage using multi-body dynamics," CD-Proc. of the 12th IFToMM World Congress, Besançon (France), June18-21, pp. 1—6. Hanzaki, A.R., Saha, S.K., Rao, P.V.M., "Dynamics Optimization of Rack and Pinion Steering Linkage using multibody dynamics approach," CD-Proc. of the 15th Annual-International Conference on Mechanical Engineering, Amirkabir University of Technology, Tehran, Iran, May 15-17, pp. 1--2. Chaudhary, H., and Saha, S.K., "Minimization of constraint forces in industrial manipulators," CD-Proc. of the IEEE Int. Conf. on Robotics and Automation (ICRA 2007), Roma, Italy, Apr. 10-14, 1954--1959. Singh Deo, N.P., and Saha, S.K., "A window based user friendly kinematics analysis software for serial robots," Proc. Int. Conf. on Advances in Mech. Eng., Fatehgarh Sahib, Punjab, Dec. 1-3, pp. 1-7. Saha, S.K., Fiorini, P., and Shah, S.V., "Landing mechanisms for hopping robots: Considerations and prospects," Proc. of the 9th ESA Workshop on Advanced Space Technologies for Robotics and Automation ‘ASTRA 2006’ ESTEC, Noordwijk, The Netherlands, Nov. 28-30, pp. 1--8. Chaudhary, H., and Saha, S.K., "Constraint Force Formulation for Industrial Manipulators," Proc. Of the IEEE/RSJ Int. Conf. on Intelligent Robots and Systems (IROS 2006), Beijing, China, Oct. 9-15, pp. 1498-1503. Aggarwal, A., Shastri, M., and Saha, S.K., "Vision based control of robot using single web camera," CD-Proc. of the Int. Symp. on Robotics and Automation, San Miguel Regla Hotel, Hgo, Mexico, Aug. 25-28, pp. 318-322. Chaudhary, H., and Saha, S.K., "Equimomental system and its applications," CD-Proc. of the 8th Biennial ASME Conf. on Eng. Systems Design and Analysis, Torino, Italy, July 4-7. Rao, G., Pati, S., Saha, S.K., and Singh, S.P., Software model integrations for improved product design," Proc. Of the Nat. Conf. on Design for Product Life Cycle, BITS, Pilani, Feb. 17-18, pp. 1--8. Sehgal, S., Saha, S.K. and Kar, I.N., "Experiments based modeling and simulation of magnetorheological damper," Proc. of the Nat. Conf. on Adv. in Mec. Eng., Jan. 20-21, Jamia Milia Islamia Univ., New Delhi, pp. 214—222. Chaudhary, H., and Saha, S.K., "Analyses of four-bar linkages through multibody dynamics approach," Proc. of the 12th Nat. Conf. on Machines and Mechanisms, Dec. 16-17, IIT Guwahati, pp. 45--52. Mohan, A., Saha, S.K., Singh, S.P., and Jaitly, D., "Modeling and experimental verification of the dynamics of rigid and flexible pendulums," Proc. of the 12th Nat. Conf. on Machines and Mechanisms, Dec. 16-17, IIT Guwahati, pp. 215--222. Deo, N.P.S., and Saha, S.K., "Trajectory selection for robotic applications," Proc. of the 12th Nat. Conf. on Machines and Mechanisms, Dec. 16-17, IIT Guwahati, pp. 99--105. Sehgal, S., Saha, S.K., and Kar, I.N., "Smart damper characterization through experiments," Proc. of the 14th ISME Int. Conf. on Mech. Eng. in Knowledge Age, DCE, New Delhi, Dec. 12-14, Elite Publishing House Pvt. Ltd., New Delhi, pp. 50--56. Mohan, A., Saha, S.K., and Singh, S.P., "Simulation of rigid-flexible robotic system," Proc. of the 5th Nat. Sem. & Exh. on Aerospace and Related Mechanims, ISRO Satellite Centre, Bangalore, Nov. 18-19, pp. 233--239. Hanzaki, A.R., Saha, S.K., and Rao, P.V.M., "Analysis of a six-bar rack-and-pinion steering linkage," Proc. of Int. Mobility Eng. Congress and and Exposition, Chennai (Technology for Emerging Markets--India Opportunity, P-2005), Oct. 23-25, pp. 103--108. Nagla, K.S., Saha, S.K., Jha, R, and Mathur, A., "Kinematics of wheeled mobile robot," Annals of DAAAM for 2005 & Proceedings of the 16th International DAAAM Symposium, Univ. of Rijeka, Opatija, Croatia, Oct. 19-22, Ed. : B. Katalinic, Published by DAAAM International, Vienna, Austria 2005, pp. 259--260. Bhangale, P.P., Saha, S.K., Agarwal, V.P., and Mohan, A., "A unified dynamics algorithms for robot selection, control and simulation, CD-Proc. of the Int. Conf. on Advances in Computational Multibody Dynamics (ECCOMAS Thematic Conference Multibody 2005), June 21-24, Madrid, MBD 187, pp. 1--14. Sehgal, S., Kar, I.N., and Saha, S.K., "ANFIS based model of a magnetorheological damper,’’ Proc. of 2nd Int. Conf. on Mechatronics, Kuala Lumpur, Malaysia, May 10-12, pp. 23--30. Mohan, A., Saha, S.K., and Singh, S.P., "Hybrid formulation for robot dynamic models," Proc. of the Nat. Conf. on Product Development with Mechatronic Systems for Global Quality, Madurai, May 2-3, pp. 59--65. Chaudhary, H., and Saha, S.K., "Matrix formulation of constraint wrenches for serial manipulators," CD-Proc. of the IEEE Int. Conf. on R&A, Apr. 18-22, Barcelona, Spain, pp. 4647--4652. Kamble, N., and Saha, S.K., "Evaluation of torque characteristics of rack and pinion steering gear using ADAMS model," Presented in the SAE World Congress, Detroit, USA, Apr. 11-14, 2005; Published in the "Virtual Engineering and Development, Digital modeling and Rapid Prototyping," SP-1917, SAE, 2005-01-1064, pp. 17--23. Kamble, N., and Saha, S.K., "Effect of pinion profile modification on rack and pinion steering gear," Presented in the SAE World Congress, Detroit, USA, Apr. 11-14, 2005; Published in the "Steering and Suspension, Tires and Wheel," SP-1915, 2005-01-1273, pp. 83--90. Ramavath, P., Barma, D., Saha, S.K., Seth, B., and Jaitly, D., "Development of a direct-drive based three-DOF robot," Nat. Conf. on Industrial Problems on Machines and Mechanisms, IIT Kharagpur, Feb. 24-25, pp. 67--74. Rao, A.B.K., Rao, P.V.M., and Saha, S.K., "Performance analysis of hexaslide machine tools," Proc. of the 21st All India Manufacturing, Design and Research (AIMTDR) Conf., Vellore Inst. of Tech., Vellore, Dec. 20-22, pp. 699--704. Tilakaratna, P.D.W, Shirinzadeh, B., Alici, G., and Saha, S.K., "Mathematical models for robotic-based height adjustment of cylindrical pairs," Proc. of the 8th Int. Conf. on Manufacturing and Management, Queensland, Australia, Dec. 8-10, pp. 370--377. Shirinzadeh, B., Teoh, P.L., Alici, G., Ang, M., and Saha, S.K., "Laser interferometry-based guidance methodology for high precision positioning of robot manipulators," Proc. of the 8th Int. Conf. on Manufacturing and Management, Queensland, Australia, Dec. 8-10, pp. 850--857. Kamble, N, Marothiya, P, Saha, S.K., Priyadarshi, R., Deshmukh, K.M., and Rao, A.D., "Experimental study of torque characteristics of rack and pinion steering system,’’ Proc. of the 3rd Int. Conf. on Synergy of Fuel and Automotive Technology for a Cleaner Environment (SAE 2004 India Mobility Conference), Jan. 16-18, New Delhi, pp. 205--212. Koteswara Rao, A.B., Rao, and P.V.M., Saha, S.K., "A study of total workspace characteristics of hexaslide machine tools,’’ Proc. of the Nat. Conf. on Advanced Manufacturing and Robotics, Jan. 10-11, CMERI, Durgapur, pp. 1--7. Mohan, A., and Saha, S.K., "Dynamic modeling of flexible robots using the DeNOC matrices,’’ Proc. of the Nat. Conf. on Advanced Manufacturing and Robotics, Jan. 10-11, CMERI, Durgapur, pp. 1--8. Bhangale, P.P., Agrawal, V.P., and Saha, S.K., "Attribute based specification, comparison and selection of a robot,’’ Proc. of the 11th Nat. Conf. on Machines and Mechanisms, Dec. 18-19, IIT Delhi, pp.131--138. Koteswara Rao, A.B., Saha, S.K., and Rao, P.V.M., "Inverse dynamics of 2-dof planar parallel manipulators with prismatic actuators,’’ Proc. of the 11th Nat. Conf. on Machines and Mechanisms, Dec. 18-19, IIT Delhi, pp. 217--225. Marothiya, P., and Saha, S.K., "Robot inverse kinematics and dynamics algorithms for windows,’’ Recent Trends in Manufacturing (Proc. of the Conference on Advances and Recent Trends in Manufacturing, Kalyani Govt. Eng. College, WB, India),Elite Publishing House, New Delhi, pp. 229--237. Vijay, V.K., Shailendra, D., Saha, S.K., and Gaur, R.R., "Development of animal driven prime mover for various agro-industrial applications,’’ Proc. of the Int. Sem. On Downsizing Technology for Rural Development, Oct. 7-9, RRL, Bhuvaneswar, by Allied Publishers, New Delhi, pp. 424--429. Koteswara Rao, A.B., Rao, P.V.M., and Saha, S.K., "Workspace and dexterity analyses of hexaslide machine tools," Proc. 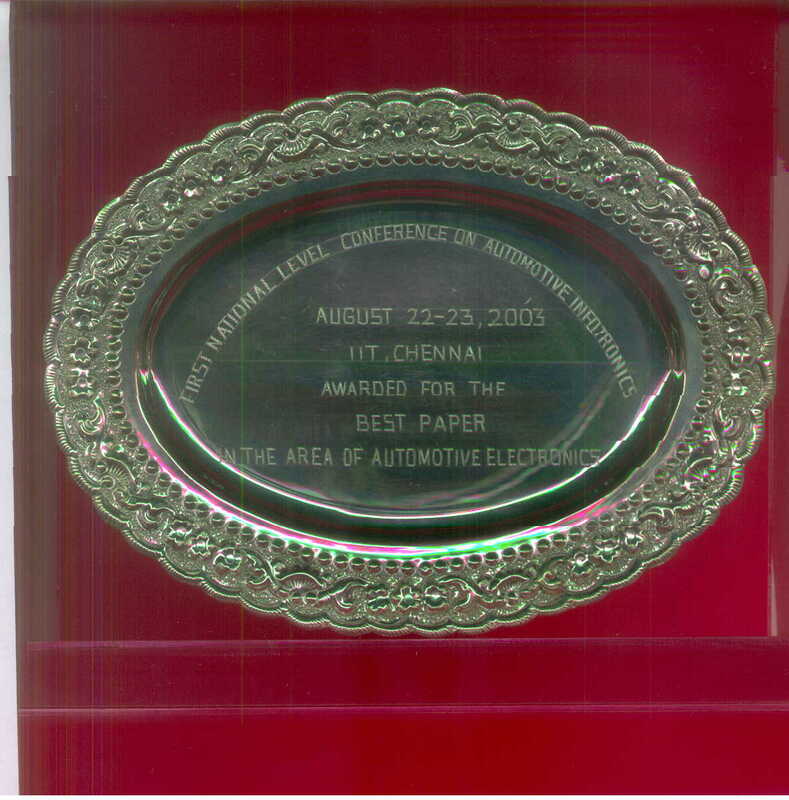 2003 IEEE Conf. on R&A, Taipei, Taiwan, Sept. 14-19, pp. 4104--4109. Khan, W.A., Krovi, V., Saha, S.K., and Angeles, J., "Recursive Kinematics and Inverse Dynamics for Parallel Manipulators," CD-Proc. ASME Int. ME Cong. and R&D Expo, Washington DC, Nov. 15-21, pp.1--12. Bhangale, P.P., Saha, S.K., Agrawal, V.P., "Dynamic model based selection criterion for robot manipulators,’’ Proc. of the Int. Conf. on Advances in Computational Multibody Dynamics (ECCOMAS Thematic Conference Multibody 2003), July 1-4, Lisbon, Pap. No.MB2003-112, pp. 1--17. Kulkarni, M.G., and Saha, S.K., "Mechatronics approach to CNC end milling study," Emerging Trends in Mechatronics for Automation (Proc. 18th IEI Nat. Convention of Mechanical Engineers), Nov. 9-10, NIT-Rourkela, pp.195--201. Saha, S.K., "An inverse dynamics software for serial robots,'' Proc. of the Nat. Conf. of Mach. and Mech., IIT Kharagpur, Dec. 21-22, pp. 131--138. Bhangale, P., Saha, S.K., and Agrawal, V.P., "Concept of decoupled natural orthogonal complement (DeNOC) for robot architecture selection,'' Proc. of the Nat. Conf. of Mach., IIT Kharagpur, Dec. 21-22, pp. 177--184. Chandrashekhar, Saha, S.K., and Kundra, T.K., "Modelling of a CNC milling positioning system,'' Proc. of the IE(I) XVth Nat. Convention of Production Engineers & Nat. Sem. on Emerging Convergence in Manufacturing Systems, Bhopal, Mar. 3-4, pp. 49FA--54FA. Dorlikar, P., Bhangale, P., Saha, S.K., and Agrawal, V.P., "Study of robots using ADAMS, Proc. of the IE(I) XVth Nat. Convention of Production Engineers & Nat. Sem. on Emerging Convergence in Manufacturing Systems, Bhopal, Mar. 3-4, pp.16RB--22RB. Momaya, K., and Saha, S.K., "Technological upgradation in Japanese firms: A case of large high-tech firms," A book on Glopalization Flexibility and Competitiveness, Eds. : Sushil and K. Momaya, Vikas Publishing House Pvt. Ltd., New Delhi, pp. 241--248. Saha, S.K., "Dynamics for machine tool component design,'' Proc. of the 19th All India Manufacturing, Design and Research (AIMTDR) Conf., IIT Madras, Chennai, Dec. 14-16, pp. 261--266. Jain, A., Saha, S.K., and Mukherjee, S., "Design methodology for a HEXAPOD machine tool,'' Proc. of the 19th AIMTDR, IIT Madras, Chennai, Dec. 14-16, pp. 279--284. Saha, S.K., "Simulation of industrial manipulators based on the UDUT decomposition of inertia matrix,'' Proc. of the EUROMECH Colloquium, Lisbon, Portugal, Sept. 20-23, pp.109--128. Mathan, R., Saha, S.K., Singh, S.P., "Behaviour of robot links made of fiber reinforced composite material,'' Proc. of the Pioneering Int. Symp. on MOVIC in Mechatronics, Tokyo, Japan, Apr. 6-7, pp. 40--45. Baghla, D., Anurag, A., Saha, S.K., Sharma, Prasenjit, S., and Mehta, G.R., "Development of a hanging planar robotic arm (HaPRA),'' Proc. of the 11th ISME Conf., IIT Delhi, Feb. 3-5, pp. 93--98. Saha, S.K., and Petkar, S., "Dynamic modelling for serial manipulator control,'' Proc. of the Int. Symp. on Intelligent Robotics Systems, Bangalore, India, Jan. 10-12, pp. 351--358. Arora, D., Saha, S.K., and Basamboo, A., "A simple gripper design for cylindrical objects,'' Proc. of the 18th AIMTDR Conf., Dec., 21-23, IIT Kharagpur, pp. 496--501. SAHA, S.K., "Virtual Prototyping of Mechanical Systems," Proc. of the SERC School, IIT Delhi, Nov. 2-14, pp. 162--169. Momaya, K., and Saha, S.K., "Technological upgradation in Japanese Firms: A case of large high-tech firms,'' Proc. of the Int. Conf. on Management of Technology, IIT Delhi, India, Dec. 21-24, pp. 325--333. Saha, S.K., "Robotics in India,'' Proc. of the Inst. of Engrs. (I) Nat. Sem. on Modern Trends in Manufacturing Technology, Nov. 6-8, New Delhi, pp. 215--221. Venugopal, S, and Saha, S.K., "Interactive design for industrial robots,'' Proc. of the AIMTDR Conf., Jan 9-11, Warangal, pp. 201--205. Saha, S.K., "Symbolic generation of the inertia matrix," Abstracts of the Int. Congress on Theoretical & Applied Mechanics, Kyoto, Japan, Aug. 25-31, 1996. Saha, S.K., "Dynamic Modeling using the DeNOC,'' Proc. of the Int. Conf. on Automation, Indore, India, Dec. 12-14. Saha, S.K., "An efficient algorithm for kinematic control of free-floating space robots,'' Proc. of the Asian Control Conf., Tokyo, Japan, July 27-30, V. 1, pp. 281--284. Saha, S.K., "A new method for kinematics of space robots,'' Proc. of the Japan-USA Symp. on Flexible Aut., Kobe, Japan, July 11-13, V. II, pp. 447--450. Saha, S.K., and Angeles, J., "On the formulation of linear homogeneous velocity constraints in mechanical systems," Proc. of the 13th Canadian Cong. of Appl. Mech., University of Manitoba, Winnipeg, Canada, June 2-6, V. 2, pp. 658--659. Angeles, J., Lopez-Cajun, C.S. and Saha, S.K., "Curvature constraints in the design of cam mechanisms. Part I. Translating flat face followers," Proc. of the ASME Des. Aut. Conf., Montreal, Canada, V. 2, pp. 259--264. Angeles, J., Lopez-Cajun, C.S and Saha, S.K., "Curvature constraints in the design optimization of cam mechanisms. Part II. Oscillation flat face followers," Proc. of the ASME Des. Aut. Conf., Montreal, Canada, V. 2, pp. 265--269. Saha, S.K., Chakraborty, A.K., and Chattopadhyay, A.B., "On machinability characteristics of zinc-aluminium (8 to 27%) alloys," Proc. of the 12th AIMTDR Conf., IIT Delhi, Dec. 10-12, pp. 295--298. Jan. 10’08, Nat. Sem. on "Engineering of Software Products: Requirements to Deliverables," NIT Durgapur, Jan. 9-11. June 04’07 (Keynote), Nat. Conf. on Emerging Trends in Mechanical Engineering, SVNIT, Surat, June 4-5, 2007 (Launched). Jan. 10’08 (Invited), "Dynamic Model of Robots for Their Control Software Development," Nat. Sem. on "Engineering of Software Products: Requirements to Deliverables," NIT Durgapur, Jan. 9-11. Jan.’03, "Robotics," Yantriki, Technical Festival of IIT Bombay. 2017, Dec. "Newton-er Dwitio Sutrer Proyjoniyota" (Usefulness of Newton's 2nd Law), Sphulinga (Annual Publication of Vidyasagar Vidyapith Higher Secondary School, West Midnapur, West Bengal) [Article saha Sir.pdf (3.73 Mb)].